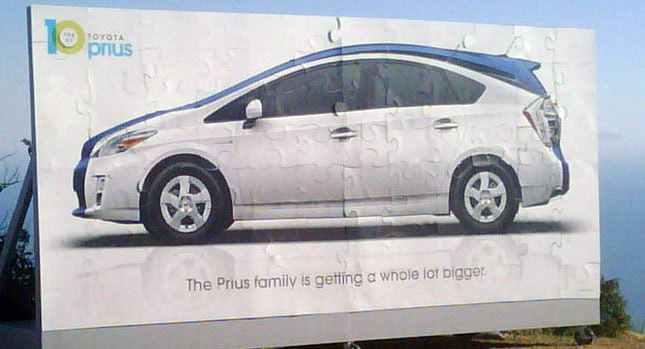 Just before the grand opening of the Paris Motor Show at the end of September, we brought you the first spy pictures of the Prius minivan (or MPV), which was snagged in California by Carscoop reader Nick K.
Since then, Toyota not only confirmed the car at a dealer conference in Las Vegas last week, but the Japanese automaker also put up this billboard that shows the Prius MPV hiding behind the current Prius liftback with the tagline "The Prius family is getting a whole lot bigger." 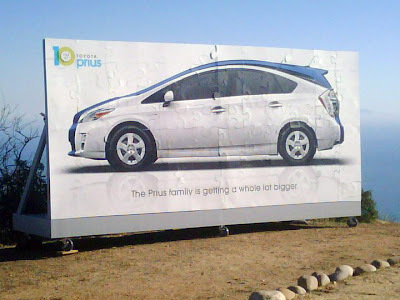 The billboard picture was uploaded on the company's dedicated Toyota Prius Facebook page. According to Autonews, Toyota execs told dealers at the Las Vegas conference that the minivan version of the Prius will be joined by a smaller Prius-badged hybrid model, with both cars scheduled to go on sale in the U.S. by 2013. The report added that within the next 18 months, Toyota / Scion dealers will also see a redesigned Camry, the Scion iQ minicar and the production version of the FT-86 rear-wheel drive sports car making their way into showrooms.